President Ram Nath Kovind has said that immense possibilities of collaboration exist between India and Bulgaria in the fields of artificial intelligence, data analytics, robotics and nano-technology. 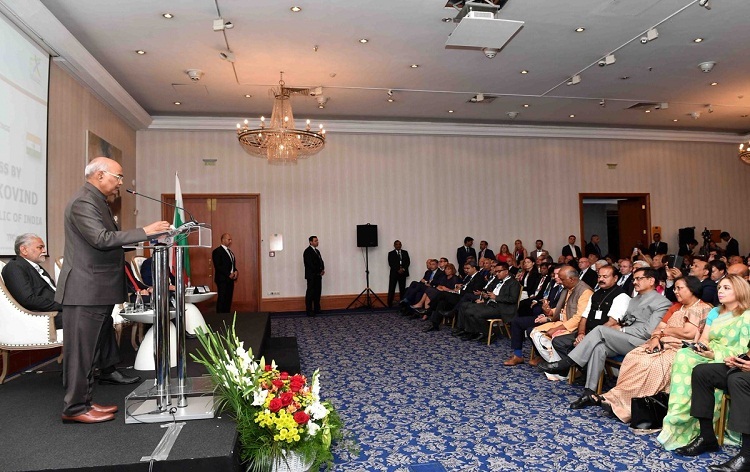 Speaking at the India- Bulgaria business forum last night, the President said that bilateral trade between the two countries which is currently only 300 million dollars a year has a vast scope to expand. On the second day of his three-day visit to Bulgaria, President Kovind made a strong plea to enhance trade and investment ties between the two countries in areas like Pharmaceuticals, Agriculture, Food Processing, Auto Components, Defence Production and Infrastructure sectors. He said there are natural synergies between the two economies which can be of mutual benefit. During the visit of President Kovind India and Bulgaria signed four MoUs in the fields of Civil Nuclear cooperation, investment, Tourism and establishment of Hindi chair at Sofia university yesterday. Earlier, Mr Kovind called for collaboration in the fields of innovation and R&D with Bulgaria. Speaking at the Sofia University last evening, President Kovind said that India today is world’s third-largest innovation and start-up hub with R&D investment expected to touch 83 billion dollar this year. President Ram Nath Kovind will meet Bulgarian Prime Minister Boyko Borissov and unveil a statue of Mahatma Gandhi in Sofia today. He will depart for Czech republic in the afternoon for the third and final leg of his journey. AIR Correspondent reports, after completing his three-day tour to Bulgaria, President Ram Nath Kovind will leave for Czech republic this afternoon on the last leg of his three-nation tour. A significant outcome of President Kovind’s visit to Bulgaria has been that both the countries have agreed to substantially upgrade their economic partnership in line with the depth of their robust political relations. Indeed, as a result of President Kovind’s visit the possibilities of cooperation and utilisation of synergy between the two countries have been identified and progress made to realise them in the times ahead.